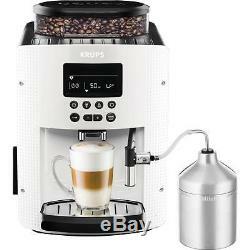 Krups EA8161 automatic Cappuccino Espresso coffee maker white. Key Facts Cappuccino System Menu: keys cleaning program ergonomic display Compact fully automatic in a class Your new machine allows you to fully automatic preparation of various beverages such as espresso, coffee or Ristretto. Even milk beverages such as cappuccino, you can prepare it. It is designed so you can enjoy the same quality as in the cafe or restaurant at home, any time of day and on any weekday, whenever you want. You will thereby be excited not only by the quality of drinks, but also by the simple operation. Possibility to adjust the size, thickness and the temperature of your beverage. This machine has a Compact Thermoblock system with integrated infusion chamber, a pump with 15 bar and processed coffee beans, freshly milled before brewing. This will give you Ristrettos, espressos and coffees convince from the first cup to a full aroma and a tanned cream layer. Traditionally, and for the complete development of its aroma of espresso is served in small porcelain cups in a tulip shape. To obtain an espresso with optimal temperature and a compact crema, we recommend that you preheat the cups. You probably need to try several coffees until you find those that you'll like most. Try to search various mixtures and / or roasting and become the ideal result. An espresso is rich aroma as a classic filter coffee. Despite its stronger, full-bodied and longer lasting taste an espresso contains less caffeine than filter coffee (about 60 to 80 mg per cup as opposed to 80 to 100 mg per cup) due to the shorter brewing time. The water quality is decisive for the quality of the result in the cup. It is best to use fresh tap water (which is not stale due to contact with the air tastes), which is cold and free of chlorine smell. The ergonomic and comfortable LCD displays navigation is easy. It guides you through all portions of the beverage preparation to maintenance of the machine. We hope you enjoy using your new machine from Krups. Some items might come with a default language in German you will have to go in the menu and select the language you need or change on start-up. Electric items come with 2 round pin Europe style plugs, we will include an adapter depending on the destination country. Counties with strict custom rules and regulations like: Russia, Vietnam, Ukraine, Kazakhstan, Brazil, Chile, Uruguay, Israel, etc, may take longer due to strict custom rules and regulations, not couriers delay. We cannot control on know about this delay in advance. Clients must check their packages before accepting and signing for them. We cannot calculate this cost for you in advance. Most countries just add VAT on the declared value of the package. The rules are different in every country. Unfortunately we cannot know the rules, regulations or practices for each country. Please check the package before receiving the item. Items that are sent back should be sent with original packing and all accessories included in the package received. 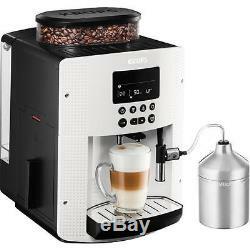 The item "Krups EA8161 automatic Cappuccino Espresso coffee maker white" is in sale since Monday, March 28, 2016. This item is in the category "Home & Garden\Kitchen, Dining & Bar\Small Kitchen Appliances\Coffee, Tea & Espresso Makers\Espresso & Cappuccino Machines". The seller is "kyriacosd123" and is located in SHIPPING FROM EUROPE. This item can be shipped worldwide.